Masura - Mint and Bazil - Polish Etc. 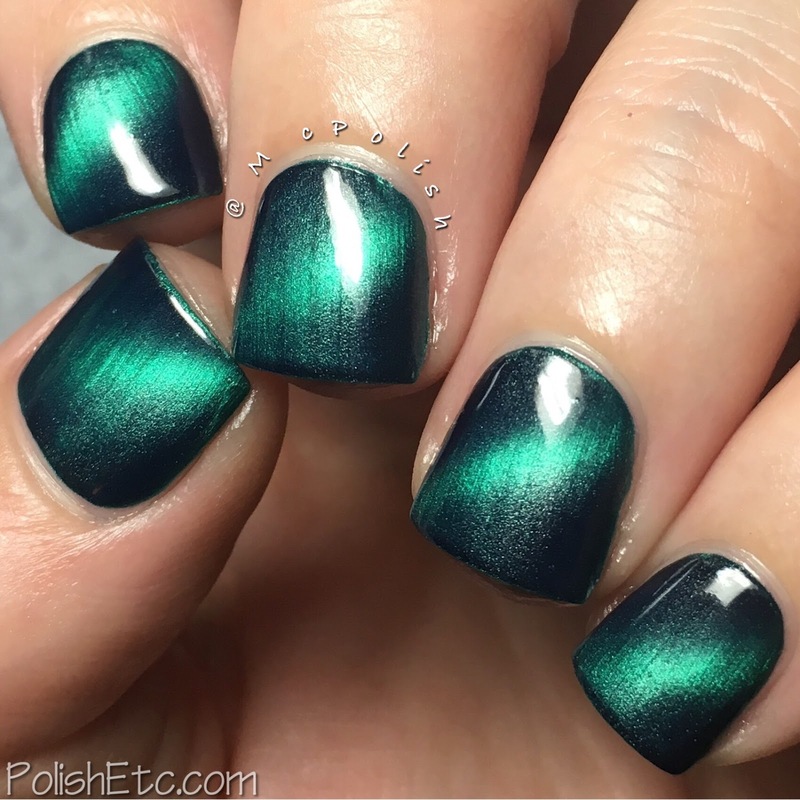 Today, I have another mesmerizing magnetic manicure to share with you. Masura is a Russian nail polish brand that creates some amazing magnetic polishes. 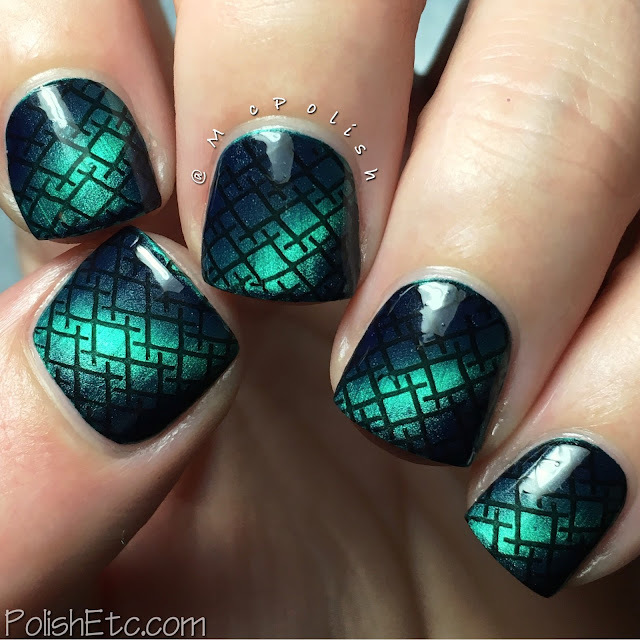 I just love how cool these polishes look. The super strong neodymium magnet is key to achieving a strong magnetic effect. I used the magnet from Masura for this mani. 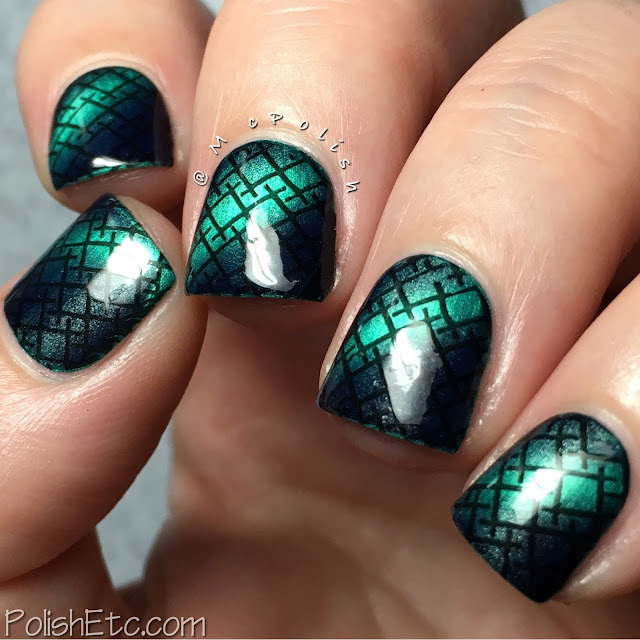 The undies of this stamped mani is Masura "Mint and Bazil (904-185)" which is a deep metallic teal. 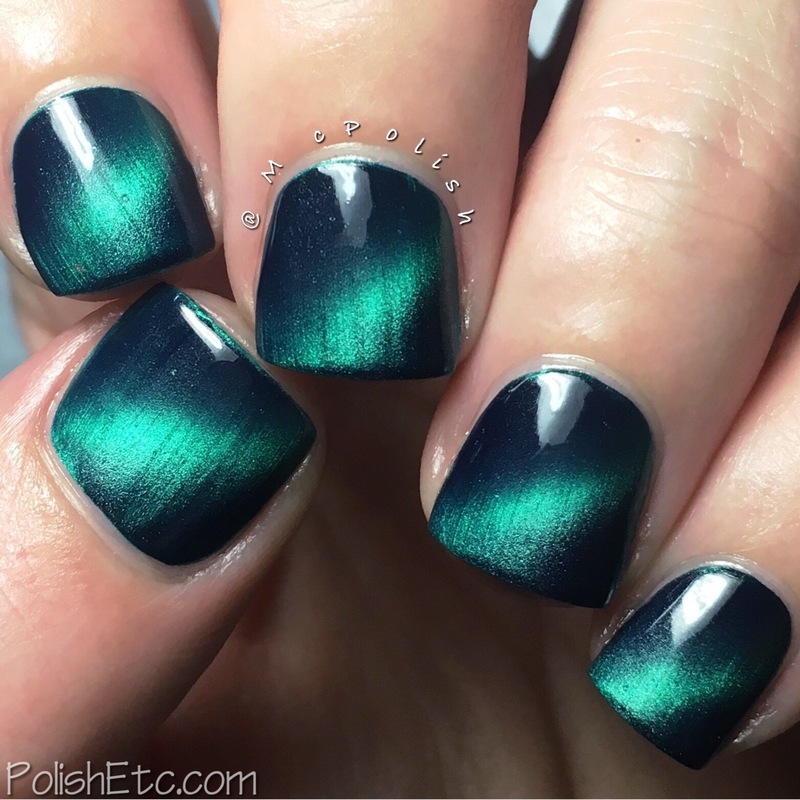 The base color in this polish seems to be a deep navy with a teal magnetic pull. 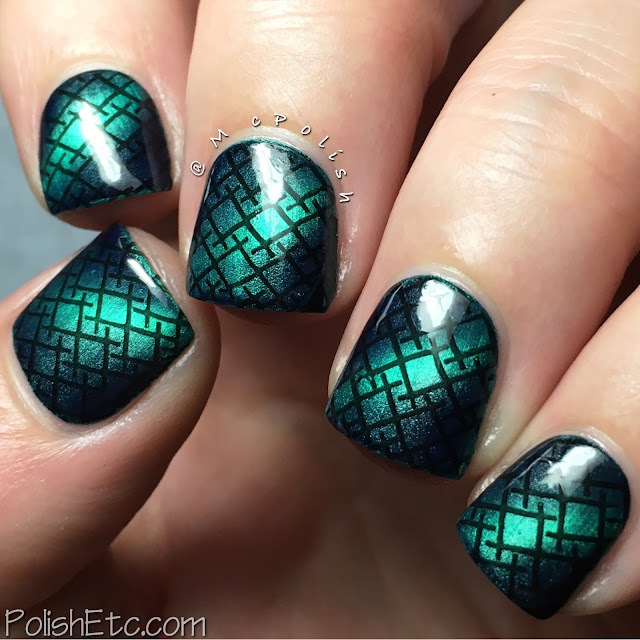 There is such a striking contrast of the dark base and teal shimmer. This polish really glows! I stamped over this mani with Masura "Obsidian (904-107)" which is a black creme using the Pueen SE01A plate. Everything is topped off with a glossy top coat. Here is "Mint and Bazil" on it's own before stamping. I applied one coat on all of the nails. Then I went nail by nail to get the magnetic effect. I applied a second coat of polish and let that dry for approximately one minute. Then I applied a glossy top coat and immediately applied the thin edge of the magnet diagnonally across the nail. I did the same pattern on each nail. 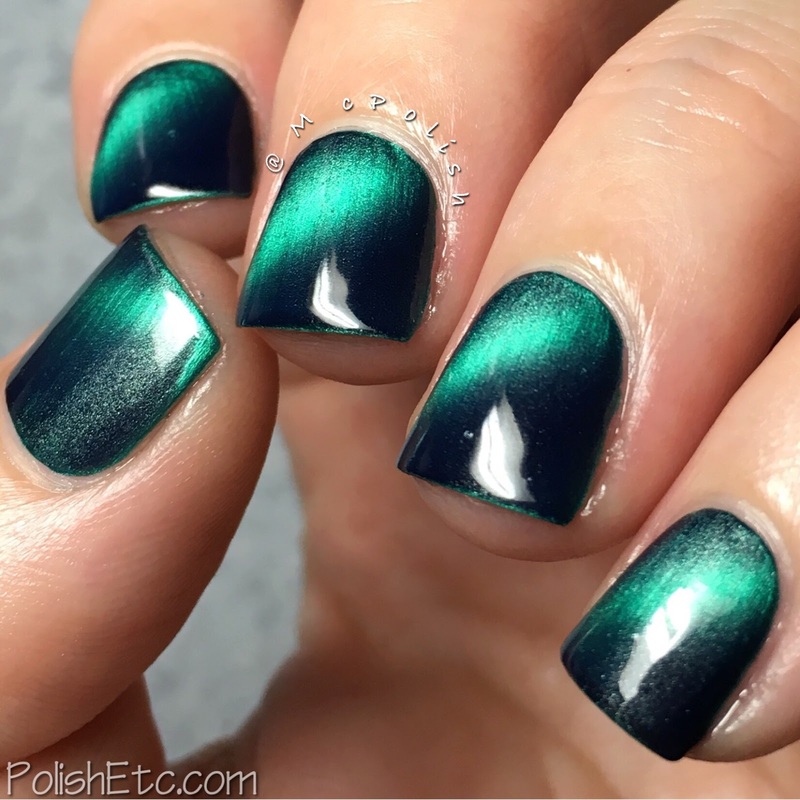 The teal magnetic stripe moves all over the nail depending on what angle you you move your hand. It is so cool. So Cool!! Photos just don't show the movement of this mani well enough. So how about a little video! Love, LOVE that glow! I like the stamping design you chose - it is strong on its own but doesn't cover up the magnetic glow. Very beautiful. That is so cool! :) I still haven't tried the magnetics... I really should do that now. I'm pretty sure there's nothing that wouldn't look good on those nails...but this is amazing! !